On 19th April 2018, Ambassador Takata presented the Ambassador's Prizes to Ms Chelsea Higgins from Massey University, and Mr Ricky Barrow from Victoria University. 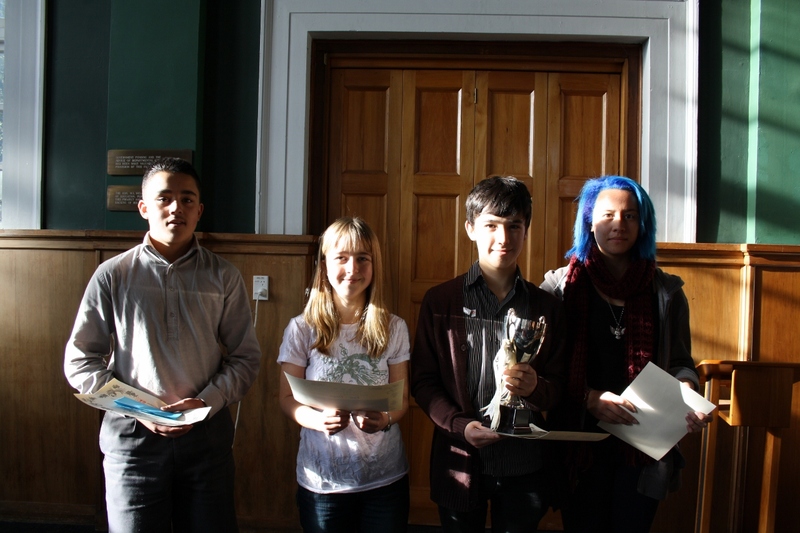 Congratulations to these accomplished young scholars for their continued efforts! 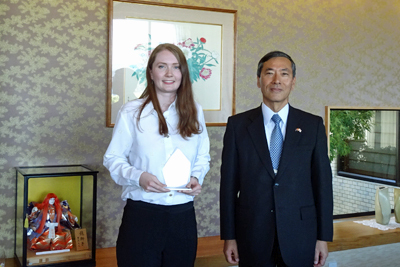 Ambassador Takata presented the Ambassador's Prizes to Ms Bella Reid who graduated from Victoria University this year and Ms Heyley Bartosh from Massey University at the residence on 1 June 2017. Ms Reid is going to Japan as a CIR (Coordinator of InternationalRelations) through the JET (Japan Exchange and Teaching) programme in July this year. 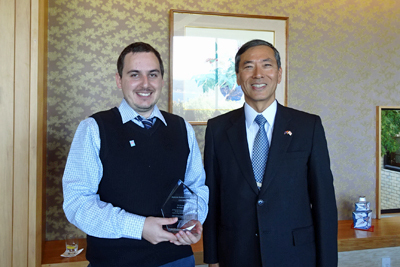 On 17 March 2015 Ambassador Nogawa presented the Ambassador’s Prize to Mr Jay Tweddle for his outstanding results amongst Japanese language course students at Victoria University of Wellington. Congratulations! Congratulations! 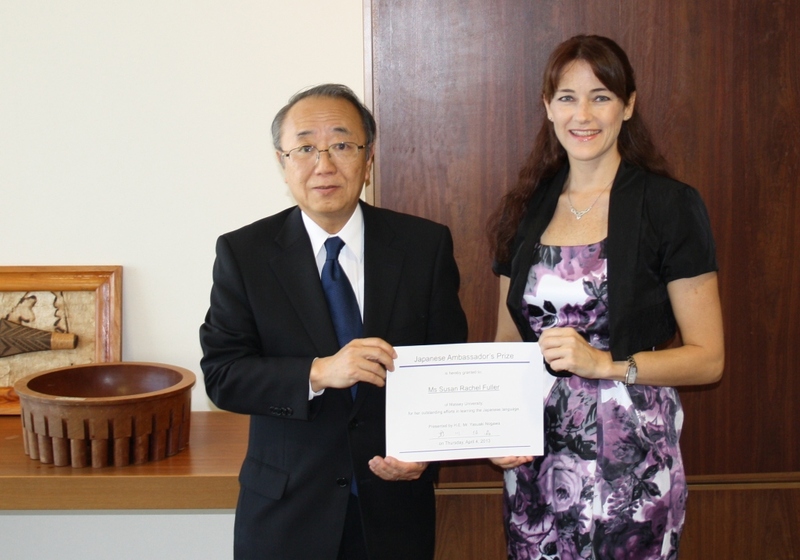 On 14 January 2014 Ambassador Nogawa presented the Ambassador’s Prize to Ms Stephanie Luxford for her outstanding results amongst Japanese language course students at Victoria University of Wellington. Ms Luxford majors in Japanese Language. She hopes to take part in the JET Programme after graduating from Victoria. 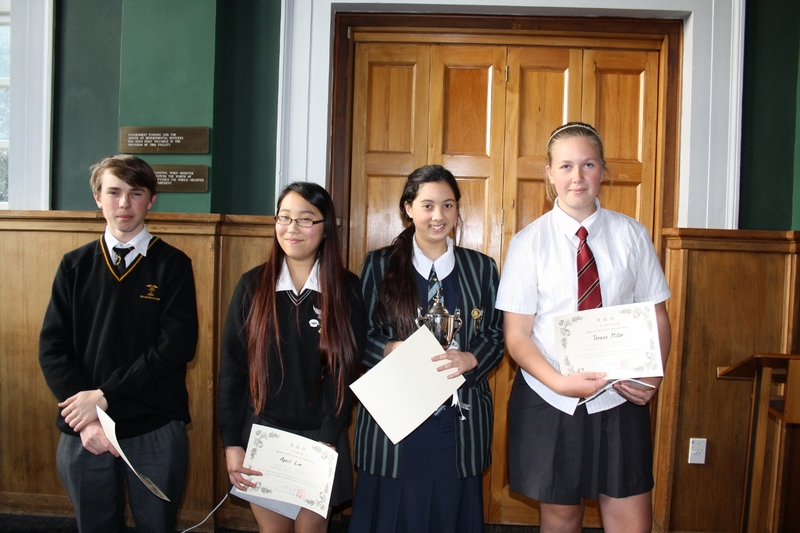 The fourth annual Wellington regional Japanese Speech Competition was held on Friday, 14 June 2013 at Firth Hall at Wellington College. 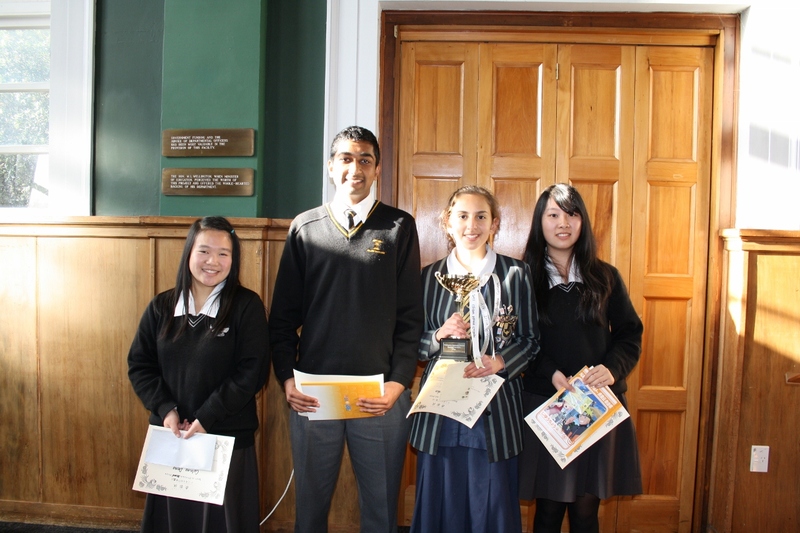 The competition was organised by the Wellington Association of Japanese Language Teachers with the support of the Japan Foundation. 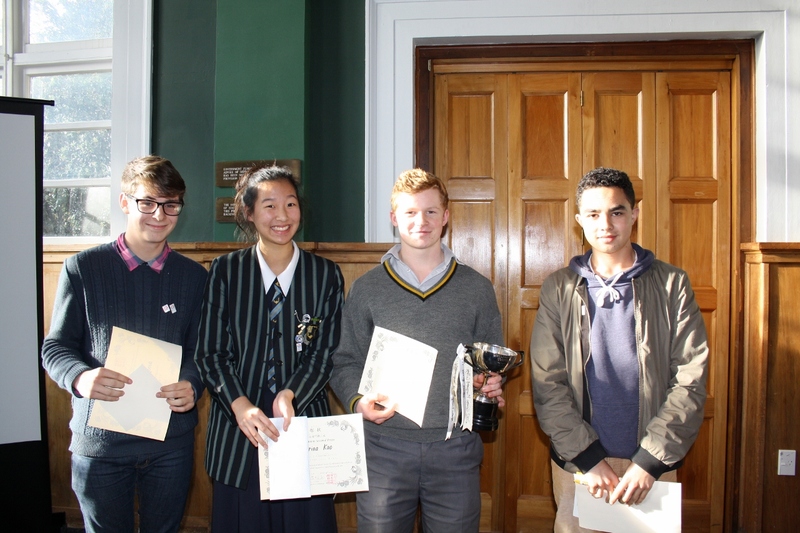 31 contestants from eight secondary schools and Victoria University took part, and the total audience, including teachers, was about 100 people. Students spoke on a variety of topics, including “Kanji”, “Sakana-kun”, and “Rice”. 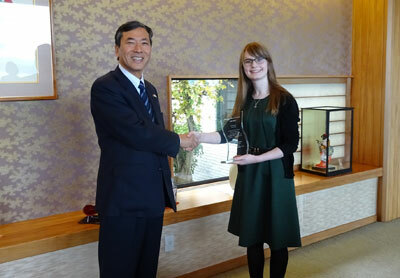 On 4 April 2013 Ambassador Nogawa presented the Ambassador’s Prize to Ms Susan Fuller for her outstanding results amongst Japanese language course students at Massey University. Ms Fuller works as a flight attendant for Air New Zealand and studies Japanese at Massey through their correspondence programme. 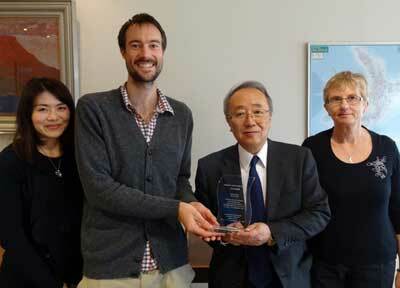 HE Mr Yasuaki Nogawa awards the Ambassador's Prize for 2012 for Massey University to Ms Susan Fuller. 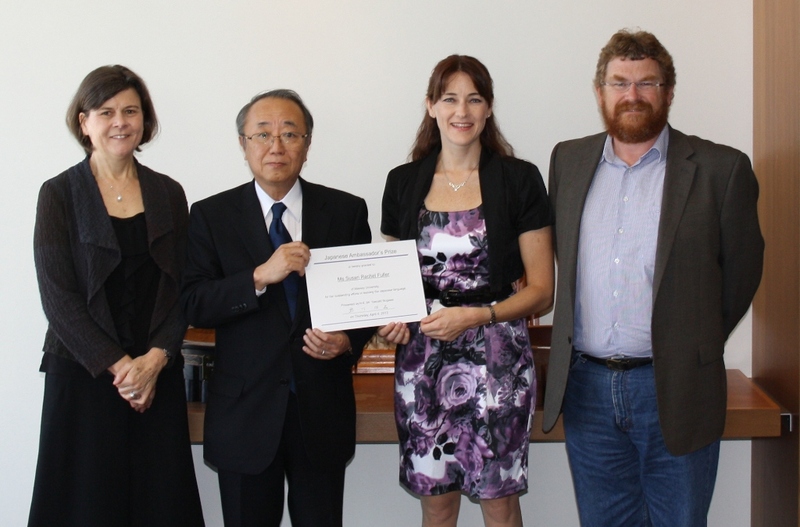 Ms Susan Fuller with the Ambassador and her Japanese professors from Massey University. 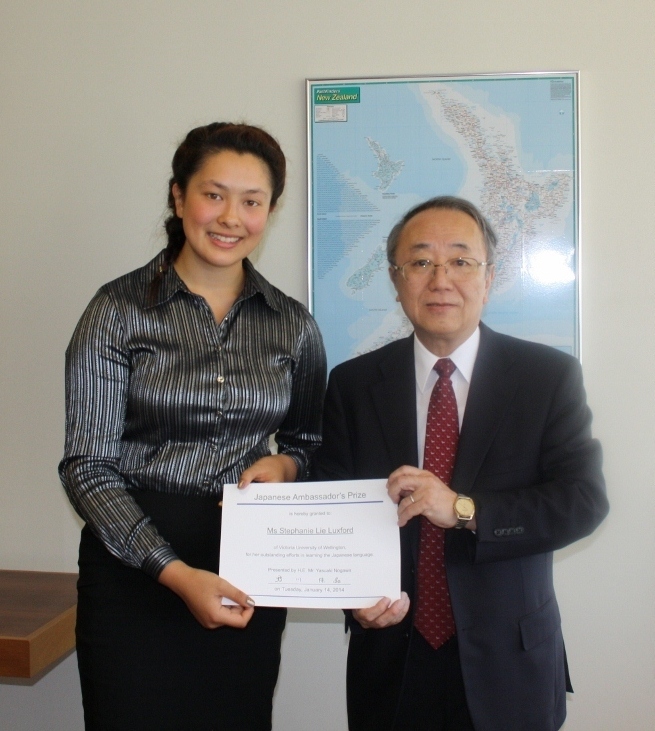 On 12 March 2013 Ambassador Nogawa presented the Ambassador’s Prize to Ms Mica Moore for her outstanding results amongst Japanese language course students at Victoria University of Wellington. Ms Moore majored in Japanese Language at the University and has previously studied in Japan under the JENESYS Training Programme for University Students Studying Japanese. 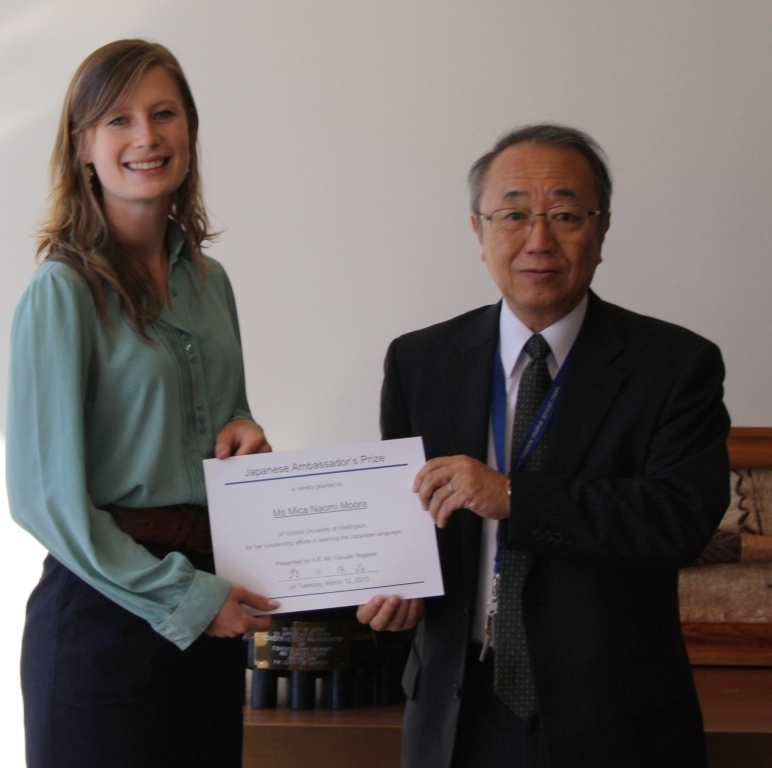 HE Mr Yasuaki Nogawa awards the Ambassador's Prize for 2012 for Victoria University to Ms Mica Moore. (From left) H.E. 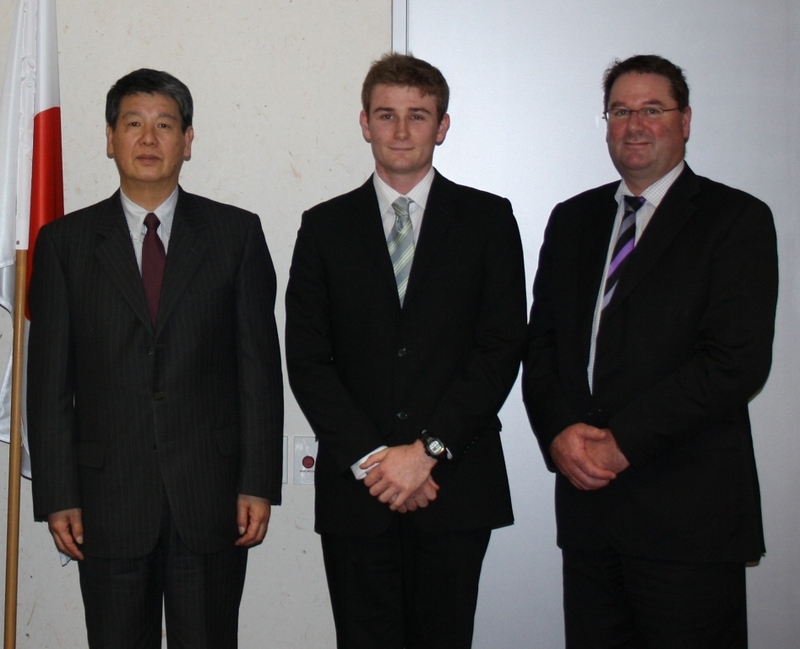 Mr Hideto Mitamura, Mr Ryan McIntyre, and his father Mr Robbie McIntyre. 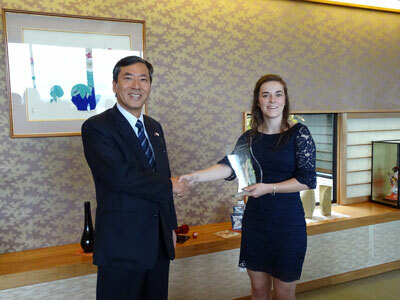 Ambassador Mitamura presented the Ambassador’s Prize to Ryan on Thursday 11 July 2011 at the Embassy of Japan. 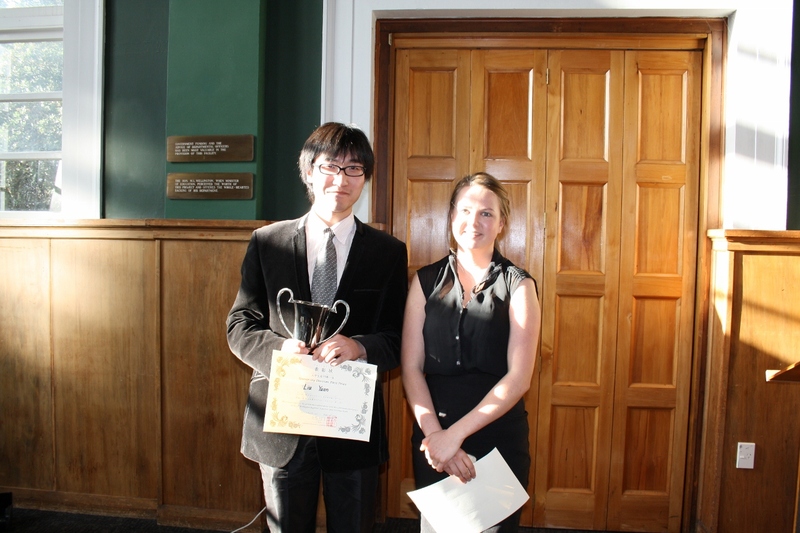 Ryan is a second-year student at Victoria University and was awarded the prize for his outstanding results amongst Japanese language course students. (From left) H.E. Mr Toshihiro Takahashi, Miss Isabel Broome-Nicholson and Dr Andrew Barke, Director of Japanese Programme at Victoria University. 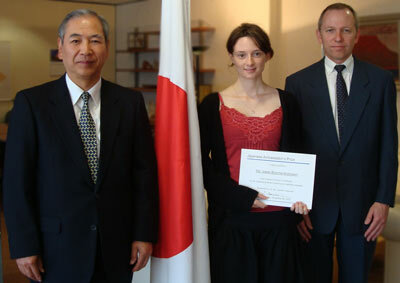 Ambassador Takahashi presented the Ambassador’s Prize to Isabel on Thursday 26th November 2009 at the Embassy of Japan. 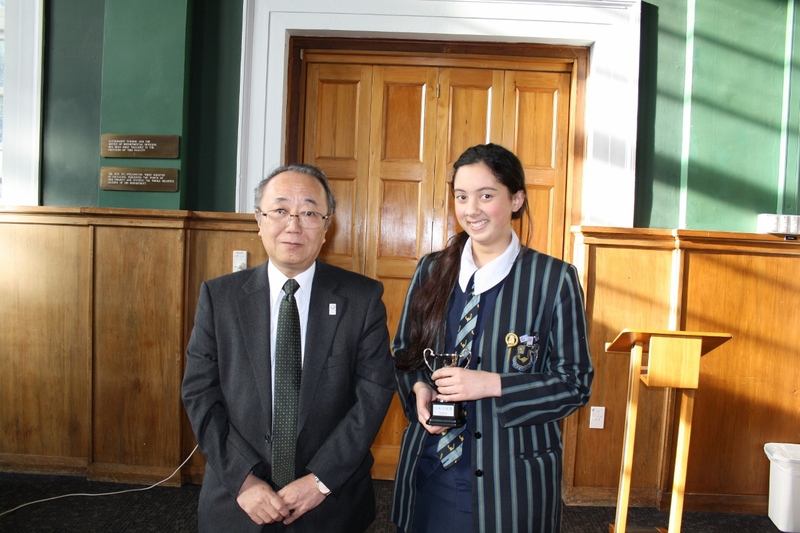 Isabel is the top student in the third year Modern Japanese Literature Course of Victoria University.